We had two new players in this weeks event. FM Christian Maier is on business in the USA from Germany. GM Roland Schmaltz told him that if he has time he should come to the Marshall Chess Club to give it a shot. He came directly from the airport (He was flying into NY from Boston) to play in the event, thus requiring a first round bye in the process. Hopefully we will have bigger crowds in the next 2 weeks, as the Deep Blue – Kasparov match is coming to town, and thus maybe some strong players from out of town will be lurking about. Next Tuesday there is actually a game, but the NY Masters will be held despite this. The 2nd week of the Kasparov match, they have Tuesday off, so I expect to see Garry at the Marshall Chess Club to prepare himself for his game on Wednesday. 1. Kedyk - Kacheishvili SEE BELOW! Giorgi Kacheishvili tends to play very quiet openings that utilize his superior chess understanding. Despite what this would lead one to believe, he has a very sharp tactical eye as well, and can be found taking great risks to win a game at times. This setup in the Sicilian often favors the player who has more experience with this type of position. If white sits around and dilly dallies, the black pieces often find a home on e5 (after an eventual f5 push by white), and blacks many central pawns and bishop pair begin to show their strength. White throws down the gauntlet, sacrificing two pawns to open lines in the center of the board and attack the black king. Perhaps stronger at this point was 23...Bf2. The rook cannot leave the back rank because of ...Qc1 checkmate. If 23...Bf2 24.Bf5 Qc5 25. 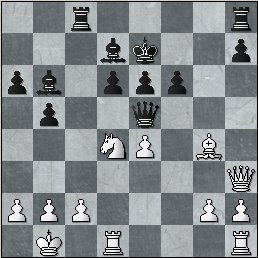 Re2 (The point being that ...Qc1 is no longer mate because of Rxc1 Rxc1 Bb1), now after 23...Kd8, white cannot play 24. 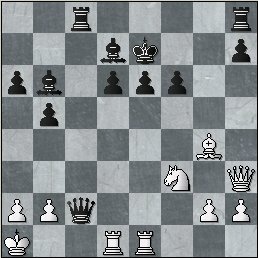 Be6 because of 24...Qc1 leading to mate. I credit all of the above to my good friend Fritz. After 23...Kd8, black remains a pawn up but white gets a lot of counterplay as blacks king is forever in the center of the board. 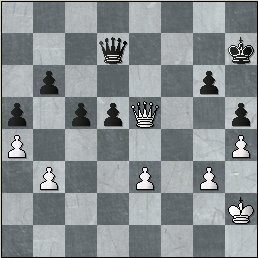 Once again we have simplified, with Giorgi having an extra 2 pawns! 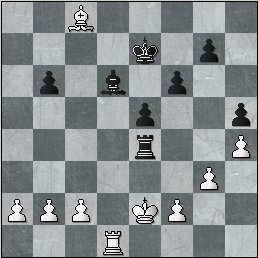 However black must give one back as whites threat of Qa8-b7 will pick up the a pawn after the Rc7 interposition. Blacks extra pawn will be EXTREMELY hard to realize, with his king stuck in the center of the board just waiting to be checked all over the place by white’s queen and rook. Note that Giorgi also was under 5 minutes at this moment, compared to Kedyk’s 8-9 minutes. OOOOH! The youngster spurns the draw. Will he go for the glory and play to win at all costs against his GM opponent, despite a pawn disadvantage??? In Round 2 we saw the qualifier, Marajudin Daftani score a victory against FM Boris Privman. Also Dmitro Kedyk continued his hot streak by knocking off FM Christian Maeir. What will turn out to be more important? 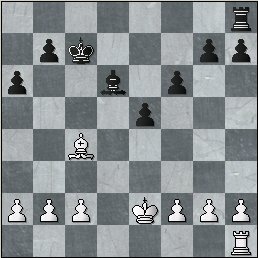 White has total control of the open f-file, but black has the weak e-pawn to attack! Boris Kreiman has come out on top. 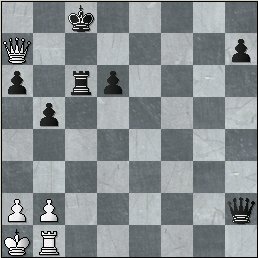 The e-pawn is gone and now the win should be a matter of technique. Everything is in order, and black will ram the d5 pawn down the board. A BIG mistake. After 45...d4 black is simply winning. 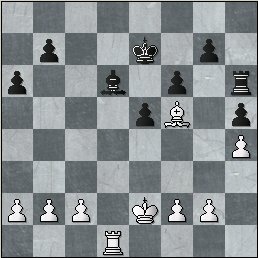 For instance 45...d4 46. ed4 Qd4 is a won endgame, and also 45...d4 46.ed4 cd4 47.Kf2 Qf5 is a winning king and pawn endgame. White delivers a simple perpetual check. D’Arruda was very happy to have escaped this game with a half point! After this draw, it meant that no player was 2-0, and thus there was a massive tie for first place. Kedyk knocked off German FM Christian Maier in round 2 to continue his fine play, however Kreiman put an end to the youngster’s hopes as he moved to 2.5/3. Bonin and D’Arruda were unable to keep pace, and moved to 2/3 after drawing. Now Kreiman had to await the winner of the Braylovsky – Kacheishvili battle. Also winning this round was the qualifier Daftani, as he knocked off filler Larry Tamarkin. A common ICC mouseslip, when one expects your opponent to go 4.Nd4 automatically. 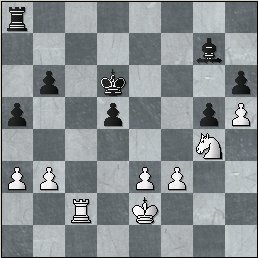 Somehow I wonder whether Giorgi didn’t notice that his opponent recaptured on d4 with the queen, as he thought for an awfully long time on the next move. In most tournaments you would see the players shaking hands and agreeing to a draw at this point, however not at the NY Masters, where it could be a big disaster to give up a second draw. Braylovsky even offered a draw 2 moves earlier after capturing the rook on d8, but Kacheishvili responded by instantly recapturing, not flinching for a second after the draw was suggested. It would really be interesting to see whether the GM could really hope to win such a position, as white is in no danger whatsoever of losing the game, due to the bishops of opposite color. Here we see the common occurance where one player presses too hard to win and makes a very simple blunder, which would never have happened if Giorgi was just thinking about making a draw. Now Gregory is playing for the win! This is the point! Now after 29.a3 e4! 30. 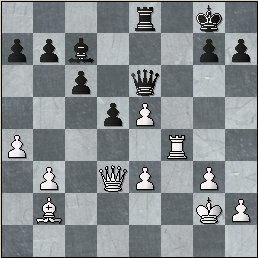 Kg2 Rc4 and 31.Bf5 no longer defends the c2 pawn. White bails out and returns the extra pawn. 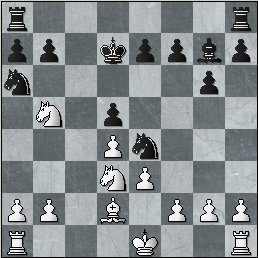 Again the online crowd was expecting a draw, but white actually has a pull here, due to the weak pawn on h5, and some possible entry points for the white king on e4-f5. 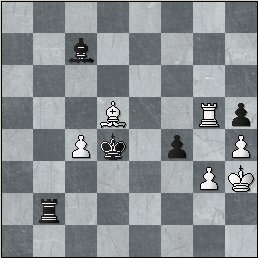 Both players were under one minute on the clock at this point, and the logical thing for black to do would be to repeat the position, as he is down a pawn. 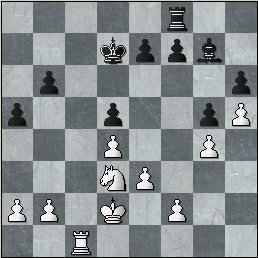 Giorgi gets a little too brave at this point, by repelling the repetition and even giving Gregory a second pawn! Oops, now Giorgi is in serious danger of losing...Of course the clock situation of 30 seconds versus 30 seconds makes this endgame into some kind of lottery…. Oops...also it was now 15 seconds for white and 23 seconds for black. The big game this round was on board 1 as Kacheishvili would need to win with the white pieces against the leader, Boris Kreiman, to get his share of first place. Meanwhile, assuming that Kreiman doesn’t win with the black pieces, 5 other players have a shot at tying for first place, yet almost all of them blew their chance. D’Arruda got smashed by Maier whereas Daftani and Braylovsky both missed wins in a mistake ridden time scramble (as most time scrambles are), but when the position reached king versus king, the players finally realized that neither of them would be winning first place and agreed to split the point. Congratulations has to be offered to Daftani, who tied the qualifier record of 2.5 points, and came oh so close to breaking the record with 3/4. (Achieved by Jonathan Corbblah and Alex Lenderman). Rafal Furdzik was the happy winner, as he knocked off Jay Bonin with the black pieces. Now he would wait to see if he and his friend Giorgi would go home as the happy co-winners, or would Boris win the game and steal first place and the entire $400 prize from everyone? IM Ben Finegold, who was watching live on the internet, explained that he had once had this position against GM Kacheishvili. It’s funny to go straight into an endgame when you are forced to go for the win, but this is where Giorgi excels. You knew that Boris would have a LOOOONG fight ahead of him to hold on to first place. 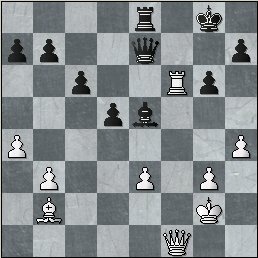 21...Kxd6 22.Nb4 a5 23.Nd3 Kd7 24.h4 Rc8 25.Rh1 h6 26.Kd2 Rh8 27.h5 g5 28.Rc1 Rf8! A nice way to get some active counterplay for black. The idea is ...f5 of course. Idea of b4-b5 and Rc6, infiltrating. Another fine defensive move by Boris. Now if 38.b4 ab4 39. ab4 Ra4! 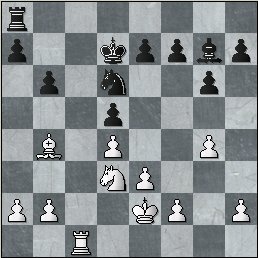 40. b5 Rc4! And now black is firmly in control. Giorgi could find no real chances to win and thus agreed to the draw, thus making Kreiman and Furdzik this week’s co-champion’s. Both players picked up $275, and Furdzik had to be especially happy as this was his first ever first place in the NY Masters!